Located on Bade Road in Taipei City, Taiwan, Golden Garden Hotel is a cozy business hotel with a nice location and convenient transportation network. It only takes an hour drive from the Taiwan Taoyuan International Airport, and a minute walk to the CPC Living Mall and the bus stand. The well-decorated hotel is very close to the most prosperous downtown street, which is a good place for visitors to get around and experience local culture. It is also near a variety of tourist attractions, companies, shopping areas, and restaurants. 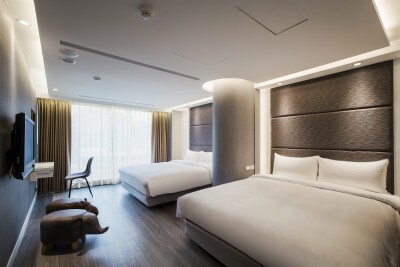 With ideal location, guests will be granted an extraordinary experience for their Taipei travel. Service Charge & Taxes included. TWD 500 for additional guest with mattress pad. Charge to be paid upon check-in. Breakfast included. Toiletries & Beddings included.